HTML is special. Unlike many other languages the browser won’t show an error message when you make a mistake. Sure, that makes it easy to write bad code, but it also allows HTML to be both backwards and future compatible. It allowed the HTML5 specification to extend the existing form field types. It allowed the RICG to create the <picture> element. And it forms the basis of Web Components because it makes custom elements possible. 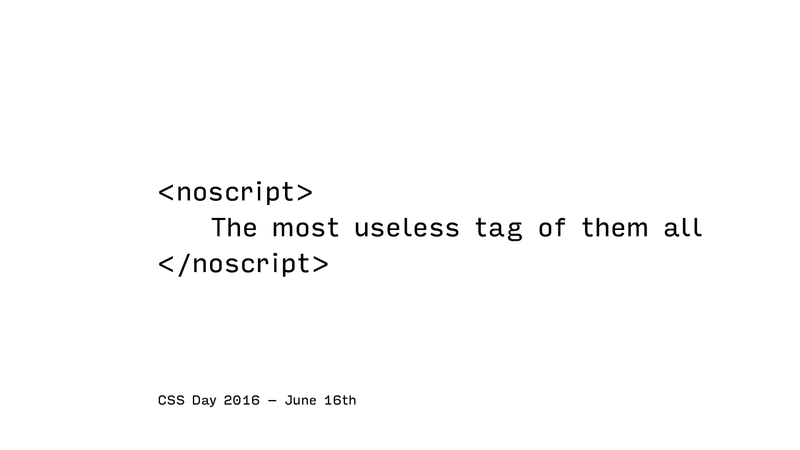 And most importantly, it allows the <noscript> tag, which by definition does absolutely nothing. This talk will explain the concepts behind graceful degradation, progressive enhancement and feature detection, and focus on how to solve practical problems with these concepts. hypermedia </A> information retrieval initiative aiming to give universal access to a large universe of documents. How can I help </A> ? HREF= ". . / R E A D M E . h t m l "
View <noscript> The most useless tag of them all </noscript> on Notist. HTML is special. Unlike many other languages the browser won’t show an error message when you make a mistake. Sure, that makes it easy to write bad code, but it also allows HTML to be both backwards and future compatible. It allowed the HTML5 specification to extend the existing form field types. It allowed the RICG to create the element. And it forms the basis of Web Components because it makes custom elements possible. And most importantly, it allows the tag, which by definition does absolutely nothing. This talk will explain the concepts behind graceful degradation, progressive enhancement and feature detection, and focus on how to solve practical problems with these concepts.